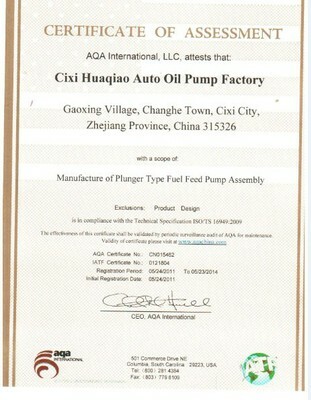 Cixi Overseas Chinese Auto Oil Pump Factory Basic Company Information * With a history of 26 years * 26 years'export experience * Ship to more than 90 countries * Employees: More than 200* Factory Area: 10,000 square meters * 6,000,000-units yearly capacity Our Product Range 1. Bosch Type Cast Iron Feed Pumps2. Bosch Type Cast Iron Feed Pumps with Sliding Tappet3. Bosch Type Cast Iron Feed Pumps with Big Tappet4. Bosch Type Line Pump5. Bosch Type Cast Iron Four Valve Feed Pumps 6. Bosch Type Aluminium Feed Pump7. Zexel Type Cast Iron Four valve Feed Pump8. Zexel Type Cast Iron Feed Pump with Roller Tappet9. Zexel Type Cast Iron Feed Pump with Short Collar10 .Zexel Type Cast Iron Feed Pump with Sliding Tappet11. Hengst Type Feed Pump12. Caterpillar Type Hand Primer13. Cummins Type Transfer Pumps14. Motorpal Type Feed Pump15. Feed Pump For Renault17. Hand Primers 18. Hand Primers (Bosch Type and Zexel Type)19. Hand Primers (Bosch Type and Motorpal Type)20. Aluminium Feed Pump Repair Kit21. Overflow Valves,A.C Valves, Non Return Valves22. Diesel Filter Assembly 1.1 L23. Banjo Bolts24. Diaphragm/piston Type Fuel Pumps Market *Africa:Nigeria,Angola,Ghana,Zambia,Mozambique,Gabon,Libya,Algeria,Kenya, Botswana,Morocco,Egypt,Sudan,South Africa, etc * South America:Brazil, Argentina,Venezuela,Bolivia,Chile,Colombia and so on. * North America: United States,,Canada and so on. * Europe: Russia,Spain,France,Germany,Italy,Poland,Bulgarian,Lithuania,Czech Republic,Austria and so on. * Asia: Saudi Arabia,India,Syria,Turkey,Lebanon,Yemen,Jordan,Iran, Iraq,Pakistan, Afghanistan and so on. Southeast Asia: Malaysia, Philippines, Cambodia, Singapore, and so so.Oceania: AustraliaCertificate ISO:90001TS16949Warranty * 1 year for product * 20 000 Km for Usage* 1% free spare parts Sales Focus * Quality always comes first * Reasonable Prices * OEM service provided * Responsible after-sales service * Aiming to get repeat orders from 90%customer after the trial orders * Making progress with customers together If you are interested in our products, please visit our website or contact us directly for more information. We sincerely welcome your inquiry. and looking forward to start mutually beneficial cooperation in an early time.